From a first time breathing underwater to professionals that have mastered the art. With our prime location in the middle of the beautiful Florida Keys, Marathon hosts a large section of the 3rd largest barrier reef in the world. Our Marathon boats have over 30 different dive sites to choose from. So, why dive anywhere else? Have family members that don’t want to dive, but like to fish? Whether you have a week to spend on vacation, or only a few hours, we can entertain you with lifelong, funfilled memories. Marathon is quiet, uncrowded, and great for families. Tilden’s is your one stop shop so, come on down,we can’t wait to meet you! Our daily boat trips leave conveniently from behind the shop at the docks of the Blackfin Resort. We do have you check in before each trip at the shop to sign the manifest and liability forms. At the dock we have a place to thoroughly rinse, dry and store your gear. We have a full shower facility with soap and hot water for you to clean up after the dive. This makes those drives home less…crunchy! There’s plenty of shaded areas to hide from the sun while you wait to board for your trip too. Our vessel is an USCG certified Island Hopper with passenger limitations of 12 divers or a max. person count of 20. 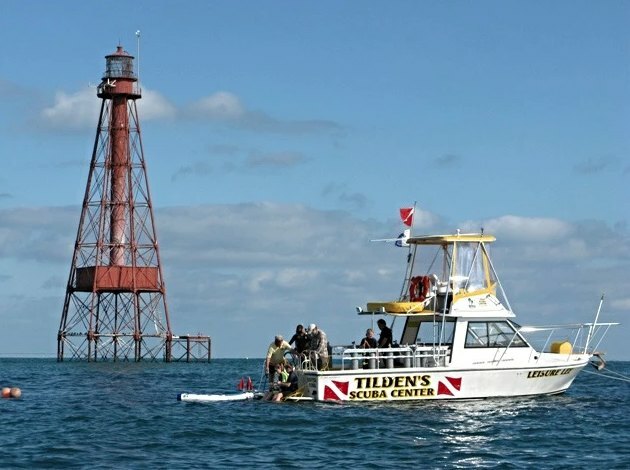 All trips are run by USCG certified Captains and are additionally dive professionals. We provide soda, juice and water complimentary on every dive trip. You are welcome to bring anything you would like to eat or drink. We have a small cooler onboard. Consuming alcohol before diving will not be allowed while on any trip, however, if you are of age, and you would like to enjoy a drink after you are done diving, who are we to stand in your way? On the following pages you’ll see we have a variety of dives to choose from. Sombrero Reef Sanctuary is absolutely gorgeous, however, we do not limit our trip to only the sanctuary. If you are into spearfishing or lobstering, please let us know when you reserve, so we can gear the trip to one of the many other wonderful reefs that we can collect on.